For thousands of Twin Cities homes, repairs and maintenance of the roofs, gutters, soffits, fascia and siding on their homes can be an overwhelming concern. Getting up on a roof or a tall ladder is dangerous, and very few homeowners have the skills or experience needed to make repairs or maintain these crucial parts of their homes. While handy homeowners can handle many jobs around their own homes, it’s always best to leave these systems to the experts. Roof Repairs – A leaky roof is a serious problem that can quickly damage the interior of your home, requiring costly repairs. Our complete home maintenance and repair company will send fully qualified roofers to your home to patch leaks in roofing materials, flashing, and around chimneys and other features. Don’t delay. Call us as soon as you notice a leak. Fast action can prevent expensive damage. 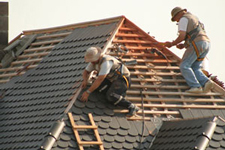 Re-Roofing Services – If your old roof needs complete replacement, you can count on the professional roofers from our fully licensed partner companies for expert roof replacement. Call for our competitively priced, top-quality roofing services and you’ll be assured of quality, performance, and durability of your new roof for many years to come. Gutter Services – Properly functioning gutters have just one job: moving water from your roof safely away from the foundation of your home. If they’re not working properly, a flooded basement could be the result. Rely on the expert gutter specialists from our Twin Cities handyman service for gutter cleaning and repair services. We also install complete gutter systems, leaf-blocking gutter covers, and gutter drain systems. One call does it all. Siding, Fascia & Soffit Services – Whatever the materials are for these features on your home, the seasoned home repair and maintenance specialists from our Minneapolis St. Paul home service company are ready to serve you. Repairs, complete replacement, cleaning, and painting services help to keep your home looking beautiful at prices that compete with anyone. Other Related Services – For roofs and siding systems, we offer a full range of services, all performed by our experienced, efficient building trade specialists. We install roof vents, replace old flashing around vents and chimneys, and repair and clean chimneys. Soffit and fascia replacement and repairs are another service we perform. Count on us for all of your home repair and maintenance tasks, all done properly, quickly, and a the lowest possible price. We’re far more than just a simple home handyman service for the Minneapolis St. Paul metro area. Our complete repair, maintenance and remodeling services are based on an extensive network of seasoned experts in the full range of building trades. That makes us a one-stop answer for almost everything having to do with your home and property. Everyone in our team makes quality, efficiency, cost-effectiveness and outstanding customer service their highest priorities. The result is a complete range of services you can trust at highly competitive prices you can count on. We don’t simply refer a vendor for your to engage and manage, we do all of the vendor selection, management, subcontractor coordination, and billing and invoicing for you. One call does it all! Call us anytime you need expert services for your home and property. We’d love to help.